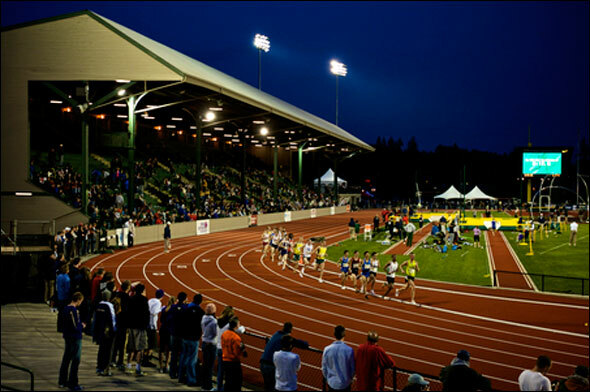 The 2016 collegiate outdoor track & field season will end once again in Eugene, Ore. this week as the best athletes in the country will flock to “TrackTown USA” to participate in the NCAA Outdoor Track & Field Championships finals. And 26 of those athletes will be members of HepsNation. To get this party started, TrackTown LIVE will be hosting a 2-day webcast preview on GoTracktownUSA.org while being simucasted on USTFCCCA, Flotrack, and RunnerSpace. TrackTown LIVE will focus on the men’s competition on Monday from 3:30pm to 5pm PT and then the women’s competition on Tuesday from 5:15pm to 6:15pm PT as they interview several finalists and coaches of note and track experts from Flotrack and Runnerspace. We recommend you tune in on Tuesday as experts will interview Paige Kouba – one of the captains of #13 ranked Harvard’s women team – as she is a Eugene native and one of the best steeplechasers in the nation this year. Full information is available here. As for the competition itself, that action will start on Wednesday at 12:30pm Pacific Time (or 3:30pm Eastern Time). We have the schedule below, including who will be competing when. Days 1 and 3 will focus on the men’s competition while Days 2 and 4 will be the women’s competition. ESPN will provide live coverage of the meet – both on TV and online (through ESPN3.com, check your cable provider) – full broadcasting schedule here. We’ll post the link to the live results once it goes live. Good luck to all HepsNation student-athletes this week! This entry was posted on Sunday, June 5th, 2016 at 3:31 pm. It is filed under Athletes, Spotlight. You can follow any responses to this entry through the RSS 2.0 feed.